Purpose: Use this document as a reference for entering employee pay increases using comp rate codes in ctcLink. 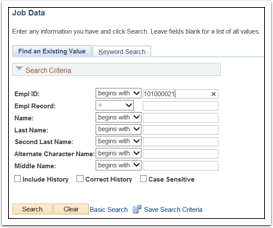 NOTE: Certain Compensation Rate Codes are pre-defined in ctcLink HCM. The employee's calculated compensation is based on the rate code that is specified. Modify the rate code as needed. Select the appropriate Empl Record from the Search Results section. The Work Location page contains information about an employee’s job, such as position, regulatory region, company, department and location. Information on this page reflects the last action for this employee. Enter the new Effective Date in the Effective Date field. The system will default to today’s date, modify if needed. Select Pay Rate Change from the Action drop-down list. Select Adjustment from the Reason drop-down list. Click the Compensation tab. 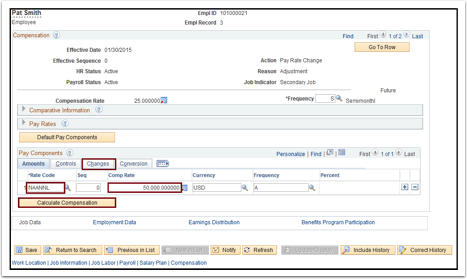 Use the Compensation page to specify the compensation rate for an employee. Select the appropriate Rate Code. NAANNL and NAHRLY are currently the only options used. Enter the new pay rate in the Comp Rate field. Click the Save button.13. Process complete.